Mums are great, aren’t they? And Jane’s is no different. After her father passed away it was just Jane and her Mum for a couple of years until Rebecca met and married Benjamin Trainer. Jamie’s Mum had died when he was very little and he is very grateful for Rebecca’s influence, and cooking! Rebecca doesn’t play a huge role in this book but she will be more prominent in subsequent books. Mums know just when they are needed! I’d love to see Emma Chambers in a more ‘straight role’ – no Teletubby bridesmaids at Rebecca’s wedding. Just spent the afternoon/evening with my Mum (which is why my blog post released empty earlier – sorry about that). We visited my Dad in hospital (he’s fine), buying a new iPad case, tidying my spare room and then I cooked her tea and we watched ‘A Little Bit of Heaven’ with a great mother/daughter pairing in Kathy Bates/Kate Hudson. It’s a beautiful film but have tissues handy. Ended the night with a hug. Who’s is your favourite fictional (Book, Film or TV) Mum and why? 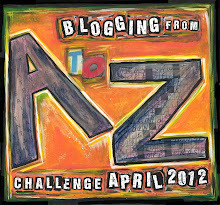 Posted on April 20, 2012, in #am writing (and all things writing related), April A-Z Challenge, Training Time (WIP) and tagged A-Z 2012. Bookmark the permalink. Leave a comment.